Historically speaking, the Silk Road was pretty important for trade purposes, exploration and travel. 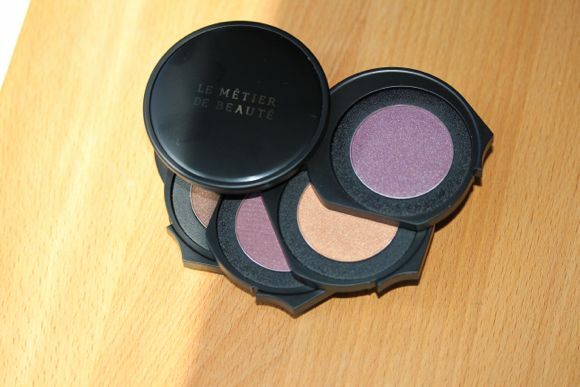 With Le Metier de Beaute's Kaleidoscope in Silk Road, it's simply a rich contraption featuring four spicy hues. Despite Silk Road's release in late 2011, I still wanted to purchase it -- the chance to try a Kaleidoscope was what I was mainly after. Four shades work harmoniously together -- a symphonic experience for the eyes. Each colour is soft, but not powdery; colour payoff is almost immediate and the ease of layering and blending is high. Working with this palette was enjoyable and seamless. Creasing and fading are a non-issue -- these shadows like to stick around. Start with an eyeshadow primer, apply all over your eyelid and blend out above your crease. Apply a neutral satin shade from your lash line to your brow bone. I used MAC's Shroom. Damask goes first, starting from your lash line and blended out slightly above the crease. Focus Tapestry on the outer half of your eyelid and sweep a bit into your crease. Make sure to leave a halo of Damask. Ikat should overlap a small amount of Tapesty and stop at the middle of your lid. Sweep and blend a small amount into your crease as well. Line the outer half of your upper lash line with Brocade and flick out to create a subtle cat eye effect. Finally, use a black liner to finish lining the upper lash line; I started at the inner corner of my eye and blended into Brocade. Liner of choice was UD's 24/7 Glide-On Eye Pencil in Zero. Oh shoot, don't forget mascara! I think this look resembles a sangria at sunset ;) Cheers! 9 out of 10 bags – Took one point off for the expense; but you get crafty packaging and high performing shades. Their blush looks like a fun time! pssst.. I'm wearing Burberry's Lip Velvet in Pink Amber on my lips.